This is basically a USB controlled RGB LED. I had the hardware finished but had no real purpose for it, so I left it unused for almost a year. 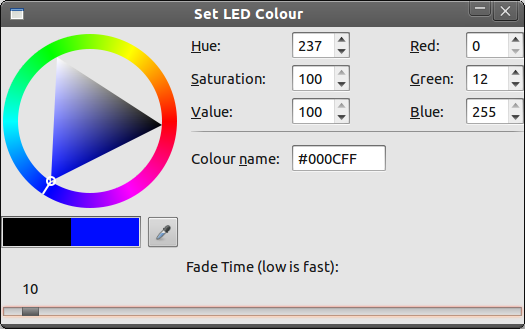 I had a GUI written, consisting of essentially just a GtkColorSelection, so I could set the LED colour to my heart's content, but that's as far as I got. Later in the year, I had some real issues with ISPs, and spent all of my time monitoring network downspeed with a gnome panel applet. All well and good, but then it hit me to use my LED as a network throughput monitor. I implemented my own PWM loop, simply doing the appropriate LED switching. There is then a 'fade to' function, which takes a colour and a speed. It adjusts the R, G and B values to move the current colour to the required one, at the required speed. The PC-side software is a bit of an ugly hack. 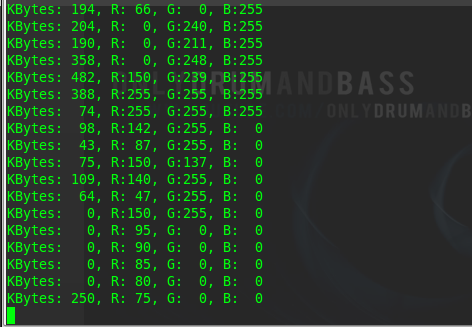 It basically runs ifconfig every second, greps out the Tx and Rx byte figures, compares it to the last read values, and determines a data rate. 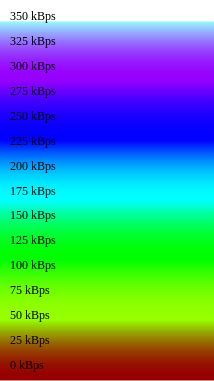 Resulting in different colours for different data rates, as shown in the picture. All the source code is avaialble in this zip. The video shows the network monitor whilst loading webpages. The terminal window is the output of the PC-side software, the line graph in the bottom of the screen is gnome's network monitor. There is around 1 second of lag between network traffic and the displayed colour. This is due to a) The refresh rate being 1 Hz, b) Averaging in software to stop the colours bouncing all over the place.